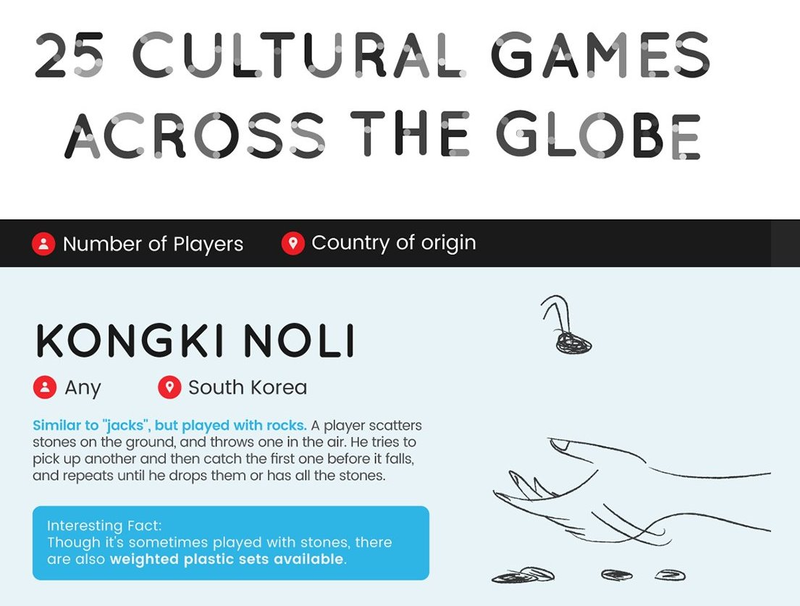 A new graphic from Pokies explores cultural games from around the world both familiar and unknown. It also looks at when they’re played, number of players required and which ones might involve aerial block-based warfare. Some of the games might seem familiar – the Korean game Kongki Noli is similar to Jacks, and Parquéz comes from the same origin as Ludo and Frustration – but there are some completely different games out there. § …Kubb, the Viking wooden-block-throwing game still played in Sweden, where teams try to knock down each other’s ‘kubbs’ in order to defend their King? § …Sedma, a card game from Romania that uses a 32-card deck, where players attempt to win tricks with the highest card? § …Pilolo, from Ghana, in which one player hides rocks, sticks, or pennies, and the other players have to find one and take it across a finish line? Some of the games listed are also tied to specific events. For example in Greece, Blackjack (occasionally known as 21) is played on New Year’s Eve, while Diwali (or Deepavali) is celebrated in India with games of ‘Teen Patti’, a variant on poker that uses three cards. And in Korea, the Korean New Year is ushered in with games of Yut Nori – a boardgame usually played with marked sticks in place of dice, and in which players try to be the first to move all their pieces around the board. Other cultural games range in complexity from Semut, Orang, Gajah – which is essentially Rock, Paper, Scissors with ants, humans, and elephants – through to Morabaraba, where players try to arrange their pieces to form positions called “mills” that allow them to remove the other players’ pieces.